Economists, computer scientists and computational neuroscientists have all been interested in models in which the structure of the internal representations on which decisions are based is assumed to represent an efficient use of finite cognitive resources. Theories of this kind go by different names (“efficient coding,” “rational inattention,” “information bottleneck,” etc. ), and the nature of the assumed resource constraint also differs in different strands of the literature. 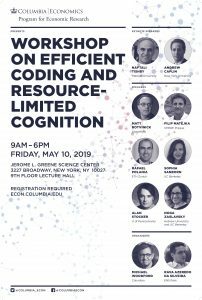 This conference, the latest in a series of Columbia University interdisciplinary conferences on the cognitive foundations of decision making, brings together leading researchers representing several of these approaches, to discuss both their foundations and important applications. The conference will include keynote lectures by Naftali Tishby (Hebrew University) and Andrew Caplin (NYU), and additional talks by Matt Botvinick (DeepMind), Rafael Polania (ETH Zurich), Aldo Rustichini (Minnesota), Sophia Sanborn (UC Berkeley), Alan Stocker (Penn), and Noga Zaslavsky (Hebrew University).